Below are just a few great stories I have received. I had a very slow computer, so went online to find ways to speed it up. (I didn't know about Mr Modem at the time and would have saved $250 if I had). I found someone who said he could fix it if I let him take control of my computer from his end. Stupidly, I let him. He advised me that I had a lot of malware, but for an additional cost -- beyond the $250 I had already paid -- he could remove a lot of it. I said, "Thanks, but no thanks." I have a DISH satellite connection with 1 gigabyte of data allowance. I later learned when that allowance is exceeded, the computer slows significantly. I have since upgraded to a 5 GB allowance and rarely have any problems. I also learned that using the Carbonite backup service consumes a lot of my allowance uploading data to the cloud. I will probably drop Carbonite when my subscription ends, as I don't have a lot of critical documents. I started my computer experience in 1996 while working at a large hospital. I was taking work home and needed a word processor and spread sheets, so I purchased my first computer. Two years later, I left that job and the computer sort of sat around and gathered dust. Then, at the age of 66, I retired because a carpal tunnel syndrome scare encouraged me to stop abusing my hands. I slowly began to become hooked on my computer. I went from a newbie to the Go-To person among my friends. Some even think I am brilliant! Little do they know, I picked up my skills painfully and after many, many mistakes, I am now reasonably skilled -- skilled enough to venture out and that is how I found Mr. Modem. So, at 73, I started my own gardening blog. Not a fancy-schmancy one, just a diary and a love of sharing gardening tips and information. I have also learned to make DVD slide shows with music! My husband, who cannot even turn on the computer, loves to have me look up "stuff" for him. Maybe the next step will be for him to read an article on his own and find out it is not so scary. The Internet has played a very important part in my life and continues to do so each and every day. Not only do I email friends and family near and far, but also use the search engines for everything from recipes, shopping, books, movies, words to songs, translations of several languages, and learning of languages but also have learned to play bridge at a wonderful site with great teachers. In addition, I use Skype to stay in touch with my daughter in California, and a friend as far away as Italy, with whom I play bridge every week online. Also, I play bridge almost daily with people from many parts of the U.S. and other countries. With the Internet, I "travel" to other countries, access art museums, food specialties, wines, and take tours through monasteries, cathedrals and other places that at my age would be difficult to visit. Each and every day I enjoy some facet of this wondrous "8th Wonder of the World" called the Internet, and I am overjoyed that I have such access to such a multitude of wonders. I really have no idea how I existed before I had this marvel of the 21st century available to me. After joining the U.S. Navy in 1943, I shipped out to Brisbane, Australia and was a crewman on the USS PC476. The next year I returned to Australia for a week of R & R in Toowoomba. While there, I met a young lady named Erna, with whom I remained in contact until I returned home, as a civilian, in 1946. Around 2004, some 60 years later, I discovered an Australian Web site being developed by a fellow (Peter D.) who was compiling information about Australia during World War II. I contacted him and sent him a copy of the CD that I had created for my ship. He, in turn, sent me a copy of his WWII data CD. On my CD were photos from Toowoomba taken 1944 that he sent to a friend of his (Dan M.) in Toowoomba. Dan decided to see if he could locate Erna and, indeed, found her residing in a Brisbane suburb. Dan learned that her daughter had email, so I sent Erna a message through her daughter and Erna responded. She later obtained her own computer and we now exchange emails a couple of times each month. all these years, thanks to the Internet. When I started working at a Senior Center 15 years ago, everybody wondered if computers were going to be of any interest to the Center's members. A small note in our monthly newsletter asked for a few volunteers to explore the possibility. Seven people showed up and through our collective efforts and combined (though limited) skills, managed to obtain some donated older computers, tables and chairs, and our computer "lab" was born. One of the first things I did was subscribe to Mr. Modem's "Ask Mr. Modem" weekly newsletter and enroll in a computer class. Once the computers were set up, another note was placed in our newsletter inviting members to attend our computer classes. Much to our surprise and delight, more than 350 people showed up. We collected names and within a month offered our first "Introduction to Computers" class. Through the years, many additional classes have been added, as our enrollment continued to grow, as it does up to the present day. Now that I'm retired, most of my email is from some of the original volunteers, as well as students I met through the years. 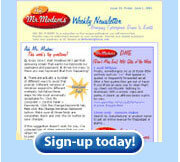 I never did finish the computer class I started, but I am still a subscriber to Mr. Modem's newsletter. The truth is, he "secretly" taught me almost everything I know about computing. When all is said and done, volunteering was the best thing I ever did, and I recommend it to everyone. My computer and the Internet are my best friends. I have human friends also, but my computer is always there for me. If I want to talk with someone at 3:00 in the morning, it's not a problem. My address book is full of interesting people who will reply when they check their mail. When I had a shoulder replaced, one of the teaching hospitals described the complete procedure on its Web site: How one prepares for surgery, the surgery itself, and what happens during the post-op recovery. Whenever I'm feeling lonely, it's not a problem: I just log into one of the kittie sites such as The Daily Kitten (www.dailykitten.com) and its blogs. In 1948, when I was 14, my siblings and I spent the summer with my aunt and uncle in a rustic cabin in Lake City, Colorado. That summer, I met a young man named Doug. I'm now 73, and I was recently thinking about Doug. I contacted the Lake City Chamber of Commerce and was placed in contact with the town historian. He didn't know Doug, but he was eager to know where my aunt and uncle's cabin was located, and if I had any photos of my relatives and the cabin. I emailed my daughter, an experienced genealogical researcher, and she emailed several photos, which now reside in the town museum! Unfortunately, I never was able to locate Doug, but thanks to the Internet, I keep in contact with my daughter in Utah, my sister in Newcastle, California, and a good friend in Spokane. Hurray for the Internet! In the course of traveling to many countries with my grandchildren, I have enjoyed meeting and getting to know individuals whom I wished to maintain as friends. Every day I usually send or receive email from or to one of these friends, sharing jokes and other items of interest about things happening in our respective lives. I so look forward to receiving their messages which make me feel closer to these people than many individuals I see here at home. To me, the Internet has truly been a life-changing event that has altered how I view the world. I would surely not be happy to lose the use of it. As a senior citizen, in 1998, I began a genealogy search on my family. I spent many hours at libraries, using Mormon resources, the Archives in Washington DC, etc. and found three original families sharing our surname, but could never legitimately link them as relatives. There was lots of evidence suggesting a familial relationship, such as all three families coming from one city in Ohio, and all being godparents to each other's children, but no obituaries confirming that the three were related. I did discover, however, that all three families had ties to Obersinn, Germany. I then Google'd Obersinn, found a family with our surname still living there, contacted them, and they referred me to a local family genealogist who had the documentation I was seeking. I had spent six years compiling data, which is priceless in itself, but in a little over a week I found the missing links to my family in the United States, thanks to the Internet. While not speech-impaired, it was my habit to phone friends throughout the country at least once or twice a month to stay in touch. With impairment setting in, this became difficult to do as my speech started to sound like a fighter who has had one too many fights. Along came the miraculous computer and the Internet, with instant messaging, which quickly took the place of the telephone! Although verbalizing is very difficult, my fingers (and brain) work really well so I can still stay in contact with friends and family despite my speech impairment. I was looking at names of people in my family on the Oklahoma Unclaimed Property Web site, and I found someone with my maiden name. I had never lived at the address it had listed, but it was only one mile from my childhood home of 20 years ago. I then realized it was a property my grandfather owned where my dad had run a family business. As it turns out, my unclaimed property was a life insurance policy that my grandmother had purchased for a nickel a month when I was born. I filed for the claim and received a check for about $280, which I deposited in my son's savings account. Even though my grandmother has been dead for 20 years, it gives me a warm, fuzzy feeling inside to know that she did that for me, and that it's finally where she intended it to be. In 1957, when I was a lonely G.I. in France, I was befriended by Paul P., his wife, and five small children. When I returned to the States, we corresponded for a few years, but then lost touch for more than 30 years. One day, while cleaning out a desk, I found a very old address book that contained Paul's name, along with other high school and college friends. Using Yahoo's People Search, returned five "hits," including an email address for a person with the same name as Paul's youngest son, who was three when I last saw him. I sent off an email, but received no response. I then composed a letter and using an online translator, had it translated into French and shipped it off to all five search results. Within a week, I received three emails from France: From my long-lost friend Paul, his son, and a daughter. I have since had frequent email contact with Paul, five of the seven children, and several of the grandchildren. It is a wonderful connection with old friends from many years ago; connections that would have been virtually impossible without the Internet and online translators. In the late 1950s, my father was stationed in Kitzengen, Germany. One of his best buddies was Felix, a Mexican citizen. In 2000, my dad attended an army reunion. Felix, who had returned to Mexico years before, was not present and nobody knew how to contact him. When my dad learned that reunion organizers had used the Internet, his interest in computers began. My brother and I got him a computer and Internet access. Not long thereafter, I received an email from him saying that he had located Felix in VeteranSearch. "I waved goodbye to him as the train pulled out from Kitzengen 43 years ago, and haven't seen him since. We hope to get together some day. Thanks to the Internet, this is possible." I was a close friend of L. in grades 8 and 9 in 1944-45. His family moved away and we lost touch after a few years. Last month while chatting with a neighbour, the subject of building model airplanes as kids came up in the discussion. This triggered my memory of a pastime L. and I shared. Thinking of L., I went to the "Canada 411 - Find a Person" Web page to determine if I could find him. A positive hit came with an address not too far away. I wrote a short letter enquiring whether the person was indeed my childhood friend, L. It was! We exchanged pictures by email and arranged to meet with our wives for lunch. We very comfortably shared our experiences of the intervening 60 years and expect to continue the restored contact. When I was ten years old and questioning why I didn't look like either of my parents, my mother told me that my "Dad" was not my birth father. She showed me a picture of a tall blonde man, with glasses, and said that he was my birth father. I learned that he was stationed in Germany and dated my mother, but he also had a wife and son waiting for him in Iowa. He transferred back to the U.S. in 1956 and was never heard from again. My mother was pregnant with me when he left. It wasn't until I had my own child that I began to wonder who this man was and if there was anything medically I needed to be aware of. All I knew was his name and the town in Iowa where his family lived more than 40 years ago. One day in early 2003, I typed the man's name in a "People Finder" search engine. To my surprise, five names with addresses appeared, with two of them being in Iowa. I sent letters to each one asking only if the person was stationed in Germany in 1956, if they knew my family, and if so, to please contact me. In August 2004, more than a year after sending out my letters, I received a telephone call from a man who identified himself with the name my mother had given me so many years earlier. He said he was stationed in Germany in 1956, he knew my mother, and that she was pregnant when he left. I told him that I thought I was his daughter, and he acknowledged that I was. The story doesn't have an ending yet because we haven't met, but we do email each other every week. I did learn that there is nothing medically I need to be concern about, and above all, I have gained a greater appreciation for the other man who I've called "Dad" all my life. One day a message with the Subject line, "Remember my front porch?" showed up in my inbox. My instinctive reaction was to delete it as spam, but something stopped me, and I reluctantly opened it. Instead of spam, it was a message containing memories of times past and, as you might guess, a girl. Her name was Debbie, from my old Chicago neighborhood, and more than 30 years after I left the area, she came across my email address on a reuinin Web site and decided to try to contact me. I'm glad she did. Her cryptic Subject line opened a floodgate of memories of the fun times our "gang" enjoyed hanging out on her parents' front porch during our high school years. What followed was a flurry of email messages that filled in the 30-year-gap from the time that I escorted Debbie to her senior prom. Thanks to the miracle of the Internet, we have remained in touch, sharing our memories, our good times, and the bad. When I was young I used to wonder why the "old folks" always wanted to talk about the old days. Now I understand: The friends you make and the experiences you share in your youth are the ones that most withstand the test of time. In 1996 I was recovering from the effects of chemotherapy for breast cancer. I decided to treat myself to a new computer and connected with the Internet for the first time. One time when I was online, cruising around and enjoying the information at my fingertips, a pop-up appeared that asked if I wanted to find someone. I knew I had a half brother who lived in New York at one time, but other than his name, I had no information. I don't know why, but for some reason I decided to take a gamble. In about two seconds his address and phone number appeared in front of me. Unbelievable. Not wanting to shock him too much, I decided to write him a letter. As it turned out, he didn't know of my existence until he received my letter. To make a long story short, he came out for a visit in October of that year, and we've traveled back and forth ever since. In fact, as I write this to you, I'm awaiting his arrival for another visit. Between 1918 and 1923, Mom's father worked in Australia, building a highway. My grandfather and grandmother, my mother and her sister, traveled to Australia by boat, then resided in Sydney during that period. My grandfather had a secretary there named Sammie H., and Mom's next-door playmates were two brothers, Robert and Peter S.
In 1999, my 88-year old father passed away, leaving Mom after 64 years together. Understandably, she dearly missed him. Shortly thereafter, aware of Mom's loneliness, I asked what I could do for her. To my surprise, she replied, "Could you find Robert, Peter and Sammie's family?" My Internet experience was non-existent at the time, but I had a background in investigations, so that, plus nine free hours each month with Juno, made me eager to accept the challenge. After three months exploring all kinds of online directories in Australia, New Zealand, Fiji, Tasmania, and the South Sea Islands, I compiled a list of 54 individuals I hoped might have some information or family connection, and sent letters to each of them. Three months later, while listening to my answering machine messages, a voice with a strong British accent said, "Averill, this is Gordon H. I am the grandson of Sir John Maynard H." After several conversations and letters, I learned that Peter S. had passed away, but I made contact with his son Roger, who frequently called and wrote to my mother thereafter, as did members of both families. With these reestablished connections, an entirely new and exciting dimension was added to my Mom's life. My mother has since gone to be with Dad, but through the miracle of the Internet, I was able to help her reconnect with her Australian childhood memories, and relatives of people she knew as a small child, which created a spark that brightened the rest of her life. In 1966, while attending Army training in Ft. Monmouth, NJ, I first met John W. I was then sent to the 125th Signal Battalion, 25th Infantry Division, Cu Chi, Vietnam. Coincidentally, a few weeks later John ended up in the same unit and we worked together. At the end of my tour I returned to the U.S. and was stationed at Ft. Huachuca, Arizona. A month later, John arrived up at the same post. We were great friends and saw each other often in those days, but I hadn't seen or talked with John since my discharge in December of 1968. In 2002, thinking about my buddies in Vietnam, I decided to do an Internet search on "Cu Chi" and to see if I could find anything about them. I was surprised to find thousands of references to Cu Chi. I skimmed through several sites and was about to give up when I read the words, "My tour in Vietnam was between December 1966 and December 1967. My unit was the 125th Signal Battalion, 25th Infantry Division in Cu Chi." Whoa, Nelly! I read further and found a page of photos that included some people I recognized. Finally, I saw a picture of John and then discovered that he was the Webmaster of the site. I fired off an email, included my telephone number, and within five minutes my phone rang and it was him. Yahoooo! The day John and I reconnected I was like a six-year-old at Christmas. I still can't get the smile off my face or the excitement out of my eyes. I work as a computer "teacher" in several adult day-care facilities. One of my dearest students is an 84-year old woman. Although she is confined to a wheelchair and has trouble hearing and seeing, she is as sharp as a tack and couldn't wait to "get on that computer." She wanted to know if we could use the Internet to find her son whom she had lost touch with 23 years earlier. Using anywho.com, I found four possible candidates. Not having the resources to make long-distance calls, she typed (using one finger) a letter to each person, asking if each had a mama with her name that they hadn't seen in many years. Approximately two weeks later, when I arrived to work with her, with tears in her eyes and trembling hands, she handed me a letter from her son. He was thrilled to hear from her and had no way of knowing how to get in touch with her. Since that time, mother and son have reunitedvisited, exchanged gifts, emails, phone calls and lots of memories. This lovely lady is true believer in the miracle of the Internet. One day my wife mentioned a "famous uncle" that has been dead for 40 years. I put his name into Google, and the first search result was his name and a profile about his pioneering work in the field of hydroponics. I knew he was one of five siblings and that there were cousins that I had never met. In Google, I found the email address of a man with the same name as my uncle, except he was a Jr., living in the same city in which my uncle had lived. I sent an email inquiring, "If your father had four siblings named Lee, Marie, Ruth, and Viola, then I am your cousin." I heard back from him immediately, and subsequently learned there were 13 cousins, and I have now been in touch with each of them to obtain their biographies, families, vocations, etc. along with photos. I took all of this, along with a complete genealogy of the family history on both sides of the family, and compiled it into a printed booklet that I then mailed to all of my "Kentucky Kousins." My first experience in the online world started back in 1985 when I purchased a Commodore 64 with a 1200 baud modem and logged into a few local bulletin boards. Later, I bought a Sanyo MBC-16EX5, which I still have, an 8086-8 Intel based XT with an EGA monitor and internal 2400modem. I felt like I was movin' on up in the online world. Today, with four computers in the house, three running Windows 98SE, the Internet is part of our daily life. But whenever I want to relax and play ASCii football, I turn on the old XT, and I'm right back in 1990 again. Those were the fun years, the learning years, the best years. I've been a volunteer on an Internet message board for more than three years. I have been very fortunate to have "acquired" four wonderful friends that I would have never met without this involvement. They hail from Canada to Australia to Scotland and range in ages from 60 to 68. Talk about a global village! All of us have learned much about each others families, localities and have even shared pictures via email. We will probably never meet in person, but the five of us are certainly "real" CyberBuddies and will be for a long time to come. While doing genealogy research, I investigated a Civil War web site to hunt for records of my great-great grandfather. After finding some information, I posted a message asking for anyone who might have information about him. After a few weeks, I received an e-mail message from a woman who is also his great-great granddaughter! I had not known she existed. She is descended from one of his daughters; I , from another. She sent me his picture, several of his wife, their wedding certificate, death notices, Civil War papers, etc., and filled in many missing pieces, and helped me with my research. It has been such a thrill for me to find her, and we plan to meet in the near future. When my husband became disabled, I had to retire from my job, even though I was already past the age of retirement, being 70 years old. When my son brought me his old computer, I told him I didn't want it as I knew nothing about them, but through trial and error I became a little knowledgeable about it, especially the emails. My husband was a pastor for 47 years, so I missed our ministery in the church. Now I have an address book full of friends addresses, and even have friends of friends email me to put their address in my book. I consider this sort of a ministry for me as I forward a lot of good reading material, plus a lot of silly stuff also. A lot of them write back and tell me how much they enjoy what I send. So the computer I didn't want has become a big part of my life and I feel as if I'm doing something to make some one's day a little brighter. My parents were married in 1944 and my father, a pilot, was killed at the end of the war. I knew that my father had been married before, was divorced. I had this idea that he and his first wife had had a daughter and somewhere out there was a half sister by the name of Gloria. My father had lived in N. Carolina and was an only child. One day my curiosity got the best of me and I typed in my maiden name. I was looking for anything in the south. I did find a bed and breakfast and for a contact, the name Gloria appeared with my maiden name. I learned that Gloria is the wife of Johnny, my father's father's brother's son, (2nd cousin twice removed). Johnny had four brothers and two sisters; one brother is still alive, as are both sisters. It turns out that my father and his first wife didn't have any children at all. How weird is that? In 2000, (cue the sad music and visualize the following in black-and-white) I had a cheap computer with no modem, a tedious and badly paid job, my boss bullied me and I was severely depressed. Then I had a fall at work and damaged my shoulder and back. In August 2002, I received a modest amount of compensation. (Cue exultant music, switch to Technicolor and let in the bright sunshine!) I spent my compensation on a new computer with an internet connection, got Broadband and my life has never been the same. I discovered a site of particular interest to me and joined their Discussion Forums in September 2002. In late November 2002 I was invited to become a Moderator. Later the same year I joined with several other moderators and together we created our own Web site. I have since learned HTML and set up my own personal Web site. I've discovered live webcams so I can visit locations worldwide; I can chat in "real-time" with my friends on other continents; and I can keep in touch with friends and family by email. I listen to the radio on the Internet, and if they ask for listeners' comments, I can send mine instantly. If I want to know something, chances are that Google or one of the other search engines will bring up several hundreds or thousands of sites about it. I can honestly say that the Internet has literally opened up the whole new universe to me. I am a senior citizen, a semi shut-in, and only get out to go to church and the various doctors I see regularly. I get very lonely and depressed being alone most of the time except for a visit from someone a couple times a week. A year ago, my daughter gave me an extra computer she had and showed me the basics. Before I knew it, I was emailing my brother and sisters, visiting Web sites, listening to music, and seeing exotic places - without ever leaving home. My computer has lifted my spirits and allowed me to do so many things I never thought possible, that I have forgotten about the two years the doctor told me I had to live - which he told me three years ago! I thank God every night for letting me live and for giving me my buddy, "My Computer," to enjoy for the rest of my life. As an older person, I felt very intimidated by all this modern technology. Unfortunately, I developed a neurological condition that makes speech extremely difficult for me; however, having been a legal secretary all of my adult life, typing is no problem for me. A nephew gave me a computer, and I quickly discovered you are never too old to learn. Email and instant messaging have become my lifeline to the outside world. I am really thankful my nephew decided he needed something faster and newer and he had a computer to give to someone (me). At 71 years, computer access to the world has given me untold enjoyment and knowledge. It has given me a means of escape from boredom and bad memories during times when I would otherwise sit alone with nothing better to do than think. It was suggested that I get a computer and learn to use it. I said, "I'm too old for that," but a relative gave me his early model Compaq and a modem. I persevered and though I sometimes got very frustrated, I was occupied doing something rewarding that kept my mind off the nasties in my life. I'm as happy as can be nowadays and look forward to my daily world wide trips on the Internet. Thank you for the opportunity to tell my story. I hope my message helps other folks find a new life on the Internet, as well. Since submitting my younger brother's name to the Virtual Wall Web site, I have been in email contact with soldiers who served with him in Vietnam. Some witnessed his death, and still have problems recalling it. I attended the 5th Cavalry reunion in Atlanta and was made an honorary member of their group. It was a very emotional moment for me, to be representing my brother at his unit's reunion. It was was nice to hear, from those that served with him, what a good and valiant person he was. He was only 21 when he died in combat, and was awarded the The Distinguished Service Cross. Our family is very proud of him. Shortly after I was married in 1999, at age 24, I was diagnosed with (PCOS) Polycystic Ovarian Syndrome. My doctor said if I wanted to have children we needed to go ahead and try, so we decided to take fertility drugs that the doctor recommended. After six months without success, I lost hope of having my own family. In 2000, I first went on the Internet. Doing my own searching, I found a support group with others who shared my problem. Up until that point, I thought that I was the only one who had this problem, but now I know different. I also learned that there are thousands of women who have this disease, but also have children. Thanks to my Internet group, I now have hope again. I don't know what I would have done without the Internet. I graduated from a small Catholic high school in the Northwest back in 1950. As the 50-year anniversary of our graduation approached, I decided to organize a reunion. Using the Internet, I set out to find as many as I could of my original 24 classmates. After weeks of searching, I found all but three of those still living plus one of my favorite teachers. Though not everyone was able to attend the reunion, all received a 40-page memory book which I put together with desktop publishing and scanned pictures, letters, news clippings and biographies provided by classmates. I am still benefiting from this work by way of renewed friendships with people who were important in my youth and are even more important to me now. Computing is my passion; it has added so much to my life and my friendships and keeps the old grey matter perking. I tutor fellow residents in the active adult community where I live. It is my pleasure to 'turn people on to the computer'. I am 31 years of age and the second youngest of four. My family all grew up in a small town on the west coast of Southern Ireland. For the past 10 years I have made London my home, but have brothers in California and New York and a sister in Dublin. Our mother lives in Ireland and with the nest empty she has taken to writing. As it turns out she's pretty good at it. I received a call in London one weekend informing me that she was going to be on national radio in Ireland. Through the miracle of Internet radio, not only could I hear the broadcast live, but I was also able to make and email an MP3 file for my timezone-disadvantaged siblings. Family ties know no distance, and I rely upon the bits to help keep us close. The immigrant family has become an Internet family. I was forced into early retirement a couple of years ago, so I used that newly found time to begin looking into Web-based genealogy research. Since that time I have made many connections thanks to the Internet. One of the most exciting for me was a connection to a great-great grandfather who came to the U.S. in the 1600's, settling in Virginia. I also found a connection to George Washington on my husband's side, as well as the Cherokee Chief that was one of his ancestors. I feel these experiences have helped in more ways that just genealogy. I think using the computer and the Internet helps my brain as I age because it keeps me thinking. I have located many new cousins and good friends, all over the U.S., that I communicate with by email. The computer, as a tool for seniors, really can't be beat, especially if you are house-bound due to health problems. No one knows your physical limitations on the web. All they know is your "bright brain." I have a couple of lovebird neighbors. She is 79 and he is 91. He got the news from his doctor that he was not long for this earth as he had congestive heart failure. I looked the condition up on the Web and found some breathing exercises to help with breathing. This was 3 years ago and he is back to mowing his lawn and doing the other chores he always did. I am so glad I could help by having access to the Internet. It all began one rainy day when I was interviewed for a job. I was asked to provide my Social Security Number, but couldn't remember the number and it had probably been decades since I had seen it. I called the 800 number for the Social Security Administration (SSA). After wading through layers of voice-mail, the robotic voice on the other end of the phone informed me the appropriate form would be mailed within the next two weeks. "Hummmmm," I thought. "I wonder if they have a web site." Sure enough, our faithful federal government, and the SSA, in particular, was easily located on the Net. ( www.ssa.gov). I found a link that said, "Forms to download," and the blessed words, "If your card has been lost or stolen..." Whoopee! Was I on a roll, or what? I clicked that link and up popped the appropriate form on my screen, which I immediately printed, filled out, and ran over to our local Social Security office. It took me no more than five minutes to present it to a lady who told me I'd have my card within a week, and four days later it was in my mailbox! Viola! Problem solved by modern technology! Oh. Incidentally, I never did receive that form which was to have been mailed within two weeks. I am a 64 year old mother of 3, mother-in-law to 2 and grandmother of 5 with my first computer; a Christmas gift from my children. I'm someone who had never used an electric typewriter, let alone a computer keyboard before. In five weeks I have gone from having to ask a friend how to get the screen saver off the monitor to sending and receiving email with and without attachments. I'm printing out pictures, weather reports, movie schedules and reviews and have even found two old boyfriends! My youngest son graduated from West Point in 1983 and is a Lt. Col. stationed in Colorado Springs. He has forwarded two emails received from a former West Point classmate who is stationed at the Pentagon. The temptation was too great, so I had to do it: I emailed the Pentagon! I'll bet even Mr Modem hasn't emailed the Pentagon. I highly recommend the Internet for everyone of any age. I am having the time of my life. Thank you for your contribution to my growing computer literacy! During the 1960s, I was Director of an Information Center and created its database using a manual typewriter, the telephone, reference books and punch cards. Sadly, the institute's funding was not renewed about the time I was retiring, so all the data was destroyed. I didn't know then that fifteen years after retirement, I would discover the magic realm of the world wide web. My friends continued to urge me to get on line, but I hesitated because of the stories about how complicated it was. Then I found Mr. Modem's book and I decided to give it a try. It was not that complicated and the world opened up for me. Even though I don't now have a database to create, I enjoy the endless possibilities in the list of sites --"General References", &"Arts, Music and Literature" and &"Specifically for Seniors," to name a few. As my friends and former colleagues hear about my adventures, they are now asking me if I can locate something for them. So, in a way, I have my own information center right here in the Land of Oz. I'm so appreciative that no matter what questions you're asked, you NEVER talk down to readers. Recently, I did something very stupid and want to share it with you in hopes that it might prevent any of your other readers from doing something similar. I was trying to clean the keys on my computer's keyboard. After I popped one off (the letter "i") and cleaned underneath, for some reason, it wouldn't stay put and kept popping off. I fixed it all by myself by using a dab of super glue to reattach it.I quickly discovered that was not a smart thing to do. Naturally, the key would no longer respond since it was now welded to the keyboard.I was afraid my computer-whiz of a son would put me in a home because of this, but instead, he took apart my keyboard, replaced the underside of the key with the underside of another key, and fixed it. My keyboard is as good as new.Mr. Modem, if you tell anyone else about this, except to use it anonymously, I will not hesitate to sue you. I'm kidding, of course, but please don't use my name. I'm embarrassed enough about this. When I first became a dialysis patient I was very scared and uninformed. It was difficult to get information from the doctors and nurses. It was even difficult to know what questions to ask and what information I needed to know. After six months or so I learned about a mailing list for dialysis patients on the Internet. I subscribed and was bombarded by e-mails and a wealth of information that I believe will save my life and my sanity. This list gives me emotional support when I need it and gives me expert information that I am unable to get anywhere else. I am forever grateful to the Internet. I was responsible for organizing our 45th high school reunion, and of the 110 classmates remaining, we were able to find most all of them. Many of them had e-mail addresses, so we organized our own chat room with plans to meet every Monday night.One of the members of our class is a registered nurse, and during a chat one night I was telling her that my husband was feeling very tired and that his feet felt squishy. The person I was chatting with didn't like the sound of that and started asking questions. She quickly assessed the situation and determined that he was possibly going into heart failure.We rushed my husband to MCV Hospital in Richmond, VA and he was diagnosed with an infection of the lining of the heart. He was under the care of the most able MCV doctors, and they were able to save his life.I will never forget as long as I live how a dear high school friend saved my husband's life, thanks to the Internet. My husband and I live in Nevada, but most of our family still lives in Cuba. Before the Internet, it was very hard to communicate with them. Sometimes it would take weeks for letters to get to them or from them to us. Several months ago my husband and I planned a trip to Cuba. I did all the research, contacted the State Department, and arranged for the whole trip all on the Internet. We wouldn't have known where to start planning this trip if it wasn't for the Internet. I'm a Registered Nurse living in Virginia, a single mom raising two children. Between work and spending time with my kids, I didn't have much time for socializing. About two years ago I was in a chat room with some other people talking about a topic of interest when I met "Jim" from Mississippi. He was divorced, also with children. We stayed in touch after the chat and began emailing each other. One thing lead to another and a year ago we were married. I know there are a lot of stories that don't have a happy ending, but I was one of the lucky ones. The Internet made it possible for me to meet other people at my own pace and on my own terms. I would never have met Jim if it weren't for being online. When my dad, 82, was dying of cancer, I went down to where he and my mom lived to spend his last two weeks with him. I sent my brothers email every day to keep them apprised of dad's condition.A few days before my dad died, my brother called to speak to my dad, but my dad couldn't communicate via telephone, so my brother emailed a short but poignant message about what a good dad he had been and thanked him for all the things my dad taught him and did for him. The next day my dad was lucid for a little while and I was able to read him the message. He was so touched, smiled, and then slipped away. It was the last thing he heard before he left us -- thanks to email. After losing my husband and best friend, I was casting around for a fresh focus for the life left to me. Sleep-deprived, I could turn on the radio and lights in those wee hours without disturbing a soul; I could lunch with friends or shop or run errands whenever I decided to do so. But that just wasn't enough. My two sons suggested getting a puppy, but after years of care-giving where it counted most, I wasn't ready.Then came the best suggestion of all, "Mom, what you should do is get a computer." Bingo! I had toyed with the idea before losing my husband since I realized my IBM typewriter was fast becoming a dinosaur and computers were here to stay. But I was intimidated at learning a new technology even with years of secretarial experience. With my daughter-in-law's help, I took the plunge.The first months were a love/hate relationship, but I finally began to make friends with The Monster, and suddenly, a whole new world opened for me. Today, I e-mail friends and family all over the country, check and study investment data, read parts of the New York Times each day, dabble a bit in genealogy, investigate anything on the web that strikes my fancy, and even email Mr. Modem. As one son recently said, "Hey, Mom, welcome to the 90's"